In the XVIIIth century Rome was already renowned for its fountains and a reflection of some of them can be seen in those of Vienna. The image used as a background for this page shows a detail of Fontana di Trevi, the best known Roman fountain. This fountain dedicated to the marriage of Virgin Mary was designed in 1732 by Josef Emmanuel, son of Johann Bernard Fischer von Erlach. It is not a very Roman fountain in the sense that water plays a rather minor role, but the top of the bronze baldachin is directly derived from Bernini's baldachin in St. Peter's. The very innovative curved ends of the baldachin are generally attributed to Francesco Borromini who worked under Bernini at the actual execution of the baldachin. The municipality of Vienna commissioned in 1737 a fountain to Georg Raphael Donner, an excellent sculptor who had learned the art from Giuliano Giuliani, a leading artist of the previous generation. Donner thought of providing Vienna with a "four rivers" fountain, the name given to a fountain designed by Bernini for Pope Innocent X in Piazza Navona. Baroque artists used to surprise the viewer by placing parts of their sculpture (or painting) outside the architectural elements (very often a niche, in the case of sculptures) which framed them. A fine example of this practice by a scholar of Bernini, Melchiorre Caffa, can be seen in S. Agostino. In portraying one of the four rivers of Vienna, Donner had an extraordinary idea; the river, portrayed as a young fishermen, is entirely outside the fountain and one is naturally inclined to go next to him to see if he actually managed to catch a fish. The original statues were cast in lead and were removed in 1770 because the Empress Maria Teresa was ashamed of their nakedness. In addition to the public fountains, Rome had many artistic fountains in the courtyards of private houses. In 1741 the municipality of Vienna decided to embellish the courtyard of the town hall (Rathaus) with an artistic fountain and commissioned it to Georg Raphael Donner again. The result was an extremely elegant fountain where one can see that Donner was familiar with the works of Giambologna, who had decorated a fountain in the Boboli Gardens in Florence with statues portraying the same subject and with those of Cellini who had done the same in a relief decorating his famous bronze statue of Perseus. In 1737 the last of the Medici died and the Granduchy of Tuscany was assigned to Francis Stephen of Lorraine, husband of the Empress Maria Theresa: this may be behind the choice of the subject. In Bernini's fountain in Piazza Navona the gigantic statues portraying the four rivers lay on a rock populated with animals and plants; these elements appear, although in a more anecdotic way, in this XVIIIth century fountain embellishing Akademie den Wissenschaften. 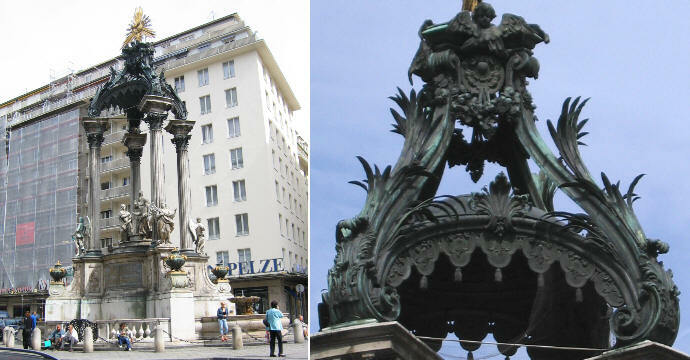 In addition to the fountain of the four rivers by Georg Raphael Donner, Vienna has two other fountains having the same subject, but not the same grace. The 1846 still fountain of Austria shows the main rivers of the empire: Danube, Elbe, Po and Vistula; the 1902 fountain in front of the huge Parliament building also shows four rivers of the empire: but the River Po is no longer among them, because in the meantime the Austrian Empire had lost its Italian possessions.